American Bard Theater Company brings three one acts from the past and presents them in the present for an evening of relevance. Uniting the works of Susan Glaspell and Marita Bonner, Visionary Voices: 2 Women Writers, 3 Big Stories is a celebration of important works for today. 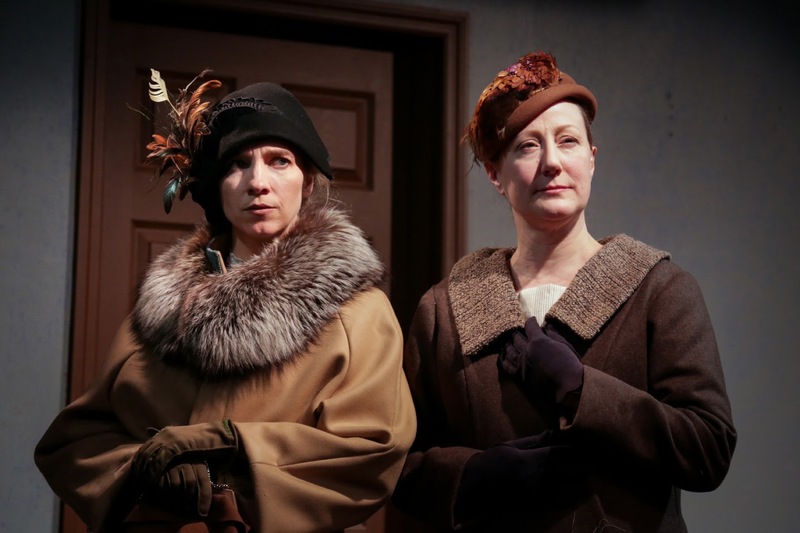 Kicking off the evening is Trifles by Susan Glaspell and directed by Aimee Todoroff. Possibly Glaspell's most revered work, Trifles recounts the strangulation murder of Mr. Wright, presumably by his wife Minnie. Trying to find clues, the county attorney, Mr. Hale, and Mr. Peters examine the upstairs of the house leaving Mrs. Peters and Mrs. Hale alone downstairs. As they wait, they come across a dead canary, leading the ladies to believe Mrs. Wright may have in fact done the crime. This one act is mystery at its core. There is immense intrigue but Todoroff needed to help heighten the stakes by amount up the pacing and fear. There was an ominous feeling, assisted by the atmospheric sounds from Matthew Fischer, but as a whole, the piece was lacking. There is inherent strength in Mrs. Peters and Mrs. Hale, yet Mel Houe and Cheri Wicks didn't quite pull it out of them as much as they could have. The next piece up was Exit: An Illusion by Marita Bonner. Directed by Tonya Pinkins, Exit: An Illusion is a dangerous tale about colorism and sexism. Dot is on her way out for a date with a guy called Exit Mann but Buddy is furious at the though. Through a rage-filled rant from a visibly jealous Buddy, Dot insists on going despite her frail state. Playing like a surrealistic nightmare, this drama pulls the fear out within us all. Pinkins capitalized upon this. Where Exit: An Illusion could have been a bit stronger was through its lighting. This play is almost a blank canvas of possibility. When the piece is directed in the manner as it was, Christopher Weston's design was not as strong as it could have been. It was too noticeable. Perhaps a practical lamp or too could have allowed more light to shine without risking the full stage flush. If your focus gets pulled by the lights, it draws attention away from the story. As Dot, Morgan McGuire was a sultry rag doll, thrown around by the powerful force of T. Morgan as Buddy. Closing out the night was a play of hope in a time of disparity. Glaspell's The People follow the titular newspaper on the verge of closing. As the news blows in the wind, a cavalcade of characters in a cornucopia of costumes arrives to share their voice and save the paper. With an important message deep within the text, the cartoonish nature of the narrative allowed for fun to be had. Directed by Todoroff, each character was given a clear and consistent identity. Through a structural lens you almost wish Glaspell could get another pass at her text but Todoroff highlighted the themes with ease. With twelve in the cast, staging all those bodies with one true entrance into the office could have been a headache but Todoroff pulled it off. Cheri Wicks as The Woman left you with a sense of triumph with her momentous monologue. Visionary Voices was ambitious in the sense that this was three different plays needing three different worlds. Wonder how you create three distinct looks for three very different plays? Ask Zhao Mingshuo. Visionary Voices was a scenic triumph. How Mingshuo made it work was extraordinary. From a Nebraska farm house to a tiny apartment in Chicago to the office of a newspaper, the design allowed each world have it’s own temperature and pallet. Sure, it may not have been the cleanest in execution but it was visionary! American Bard Theater Company has provided an important night of art for two important voice in American literature. Celebrating these texts of the brilliant women is wonderful. Visionary Voices just needed a little more polish.